"I think every president would have done the same. " When the White House announced that Osama Bin Laden was officially dead, right leaning blogs celebrated quietly and the country nodded in approval. However, there wasn't the celebration and glee that some might have expected, and even the gloating by the left didn't have any real heart to it. President Obama has done ads, television appearances, and pushed merchandising over the Seal Team Six strike, with publicity shots of him watching nothing happening on the screen in the "Situation Room" at the White House (literally, at that point nothing was taking place; they were waiting for information). He's been going around talking about it, and his staff keeps pushing the "gutsy call" which a few leftists try to defend, but can't really. Yet its not working, really. President Obama tried to say Mitt Romney wouldn't have made the call and Romney responded that even Jimmy Carter would have done it (doubtful, but a useful dig). Senator McCain stood up and pointed out that real heroes don't boast about what they did, and one of the Seal Team is grumbling about how this guy is trying to make political hay out of what they accomplished. This just isn't working out to be the campaign issue that President Obama was hoping for. 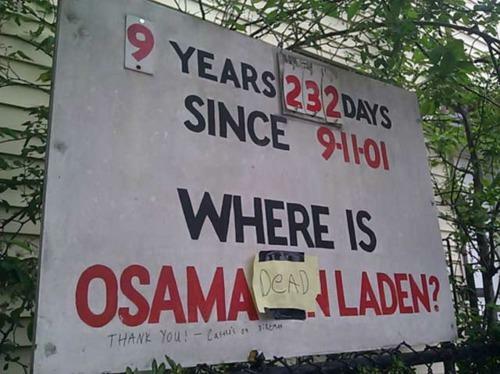 He got Bin Laden! That's supposed to count, isn't it? Instead, the president is out trying to defend his focus, saying "I hardly think that you’ve seen any excessive celebration taking place here." That's not a sign of someone having a successful campaign. Part of the problem is that Osama Bin Laden is yesterday's news. He was pretty significant in 2002, but by 2004 the failure to capture or find him was not really even a major campaign topic. He was out of the picture, reduced to sending out grainy video tapes, tentatively identified as the man by the frequently hapless CIA. He wasn't leading anything, planning anything, or influencing anything. He was just a broken and frightened old man hiding away from the world. By 2011, ten years after 9/11, he was really just a figurehead, a spokesman for al`Qaeda mouthing leftist concepts to try to generate sympathy for his ideology. Nobody really even cared if he was caught or not by that point. Sure, taking him out would be good news, but along the lines of catching one of the Weathermen from the 70s. OK yeah a bad guy was caught, but not really very relevant to today. The truth is, most people are far more concerned about the grinding poor economy than the War on Terror at this point. We're more than a decade out from 9/11 and the legacy media has been so fixated on not remembering that event that people just have tuned it out. Bad yes, but a long time ago and I can't find a job. Bin Laden being dead doesn't help with the cost of food and gas. And getting Bin Laden wasn't gutsy or shocking. Finding out a likely location and hitting it was the right choice. There was almost no risk whatsoever for the president politically, because failing to do it would probably hurt him far more than attempting and failing. All the risk was taken by the Seal team who were physically there in enemy territory. Boasting about saying "yes" to the most obvious question in the 21st century is not exactly bold leadership or very attractive. He abandoned the Green Revolution, is passively observing mass atrocities in Syria, appeased both Russia and China, pulled the rug out from under allies in Eastern Europe (on missile defense), risked victory in Iraq by yanking out all troops, set the troop withdrawal schedule in Afghanistan to meet his electoral needs, not our national security interests, and slashed defense spending (refusing at least for now to come up with alternate cuts in lieu of defense sequestration that his own defense secretary has said would be “devastating” to our national security. President Obama hasn't been as awful on national security or the war on terror as his campaign suggested he would be. He's been very aggressive about using drones and has continued to prosecute the war on terror. The problem is he does it remotely and with as few casualties as possible, Clinton-style. So we don't capture any more major bad guys to interrogate and learn anything, we just kill them. It was those interrogations which made it possible for the Seal Team Six raid to take place to begin with. Interrogations the Obama administration publicly banned and is avoiding by refusing to capture any new intelligence. In other words, it was the Bush administration's efforts and work which made this triumph even possible, while the Obama administration's efforts have blocked any similar future triumphs. And the image of President Obama repeatedly bowing to foreign leaders is a lot more potent than one "gutsy" call to do the obviously right thing. People remember the "reset button" episode and the repeated gaffes and foolish mistakes in foreign policy more than the few good moves. Whispering to Medvedev that he was going to lie during the campaign and do what the corrupt mobster president of Russia wants done did a lot more damage than one smart move can make up for. 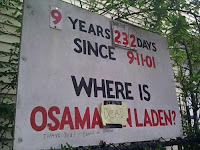 So Osama Bin Laden's death isn't really resonating with people. Maybe his polling shows that this helps with female voters, since the administration has all but openly stated they've written off most men. But I'm skeptical.